Have you ever missed an Election Day? You plan to vote, you’ve identified the candidates that deserve your vote. Then the day comes and goes and you’ve completely missed it. Maybe it’s different in other States, but here in New Hampshire, that’s not likely to happen. Missing an Election Day in NH is the equivalent of missing a major holiday. Everywhere you turn, the signs remind you, get out and vote! By State law, NH has the first in the nation primary, which is to be held at least seven days before any other State’s primary (NH.gov, Hugh Gregg, 1997). The NH House is the largest legislative body in the United States, with 400 members (NH.gov NH House Facts). For a whopping $200 per biennium, each legislator considers up to 1,000 bills per year (NH House Facts). NH was the first State to declare its independence from the British Crown, six months before the United States (NH House Facts). The legislature still meets in its original 1819 chambers, although no one sits in non-existent seat #13 (NH House Facts). These writers and artists lived and dreamed in NH: Robert Frost, Grace Metalious, J.D. Salinger, Sarah Josepha Hale, Augustus Saint-Gaudens, Jodi Picoult, John Irving, Dan Brown (Famous New Hampshireites, NH.gov and World Atlas). Baseball players Carlton Fisk and Chris Carpenter, Cy Young Winner 2005, hail from NH (World Atlas). 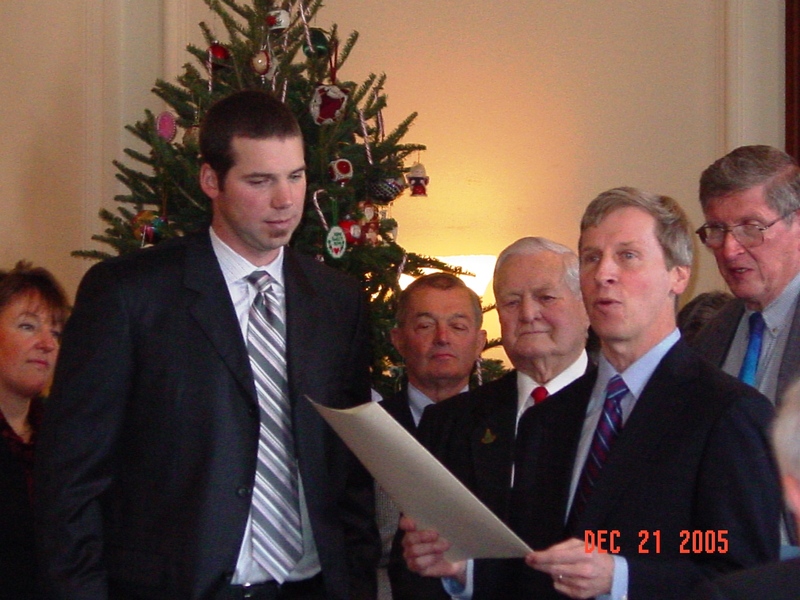 Governor John Lynch with Chris Carpenter, 2005. Copyright @brathhoover, 2014. Comedians Seth Meyers, Sara Silverman, and Adam Sandler call NH home (World Atlas). NH’s motto, Live Free or Die, comes from General John Stark’s in-absentia toast, “Live Free Or Die; Death Is Not The Worst of Evils” (Live Free or Die). So much for only writing posts about NaNoWriMo (Day 1 – 3,850 words, Rah!). Thanks once again for listening! This entry was posted in Good Neighbors, Volunteer and tagged Chris Carpenter, Election Day, NH, Vote. Bookmark the permalink. If only “cool” did describe # 2 and 3, but sadly, most of our volunteer legislators fail to show up for votes and many of them are retirees who are still living in the mid-twentieth century. We do manage to have some surprisingly progressive and enlightened laws here, though! I look forward to greeting all my neighbors and friends on election day by working at the polls that day, and in that way I always remember to vote! I hope you enjoy your election day work. Your service is appreciated!